"Very elegant, and so easy to make - you will love this lemon and lime vodka drink." This was ok. It was really sour. Not my favorite recipe for a lemon drop. 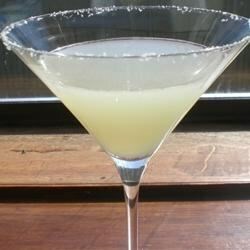 Make it a blueberry lemon drop martini by substituting .5 oz of citron with .5 oz of blueberry vodka! Yum! very tart but amazing. The sugar rim can make it or break it sometimes. without it, it can be too sour. Great cocktail! My friends all loved it, too. I used absolut citron. It was easy to make and delicious.